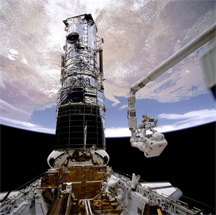 Among the most famous examples of "spills" as defined here, or rework as commonly defined, is the first servicing mission to the Hubble Space Telescope, STS-61, in which astronauts installed a set of specialized lenses to correct the flawed main mirror in the telescope. The cost of the telescope itself was 2.5 Billion USD 1990. Estimates of the cost of Service Mission 1, which installed the COSTAR mirror correction system, do vary, but a reasonable range is about 30% of the telescope cost. Photo courtesy U.S. National Aeronautics and Space Administration. We all waste time, but some people and organizations waste time habitually, on their own, while others are forced to waste time because of someone else's mistakes. We tend to notice only the mandatory time wasting that results from the actions of others, but it's useful to catalog all causes of wasted time. That information can be a guide for investigating just how much of what we do could be avoided if we took appropriate measures. In that spirit, here's Part I of a catalog of ways we waste time. The textbook definition of make-work is any activity that serves no purpose other than to keep someone busy. Supervisors do sometimes assign make-work, but I believe that most make-work is self-assigned. That is, we take on tasks that give us a sense of actually doing something, even though the output produced is of no value. For example, we sometimes devote effort to improving something that's already way past good enough. Or we produce something that might be needed later, when a little time spent in reflection could have revealed the remoteness of the chance of its ever being useful. Rework is work that was perfectly successful the first time, but which must be done again because the result of our first effort got trashed, lost, or damaged in some way. Maybe the dog ate it. Or we accidentally deleted it. Or we delivered it to the people we were supposed to deliver it to, but they trashed it or lost it or something. Carelessness can be a cause, but often the tools we use are so finicky and badly designed that damaging mistakes happen too often. appropriate measuresincident that creates a need to clean up or repair equipment, facilities, code, or any other factor of production. Spills can also create a need to treat personnel for injuries received. All consequences of spills count as effort. Some of it is very expensive, and little or none of it produces customer value. After-incident reviews are essential to reducing the incidence of spills. Rushing into something injudiciously can create spills or a need for rework if the rushing led to incorrect modification of — or damage to — deliverable items that subsequently need to be restored. But a more wasteful consequence of rushing is the need to back out work that shouldn't have been done at all. In that case, the waste consists of (a) doing the wrong work; (b) doing the work required to undo the wrong work; and (c) the meetings and debates that were necessary to convince people that the work shouldn't have been done and now needs to be undone. Would you like to see your comments posted here? rbrenFvKhxwtBKZIDuVcCner@ChacguwfpcuMILTvCCJSoCanyon.comSend me your comments by email, or by Web form. When we address others, we sometimes use filler — so-called automatic speech or embolalia — without thinking. Examples are "uh," "um," and "er," but there are more complex forms, too. Embolalia are usually harmless, if mildly annoying to some. But sometimes they can be damaging. I offer email and telephone coaching at both corporate and individual rates. Contact Rick for details at rbrengfGOYLSPekhVyBuEner@ChacayHgdMDUQjySxBFWoCanyon.com or (650) 787-6475, or toll-free in the continental US at (866) 378-5470.